It's getting to be that time of year again. When our cultural traditions threaten to make every plastic-averse parent tremble in fear. When toxic chemicals combine with sugar to make our children run around in a weird haze. 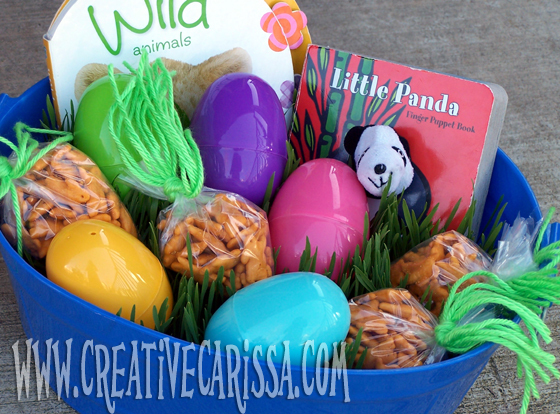 It's time for...EASTER! Ok, so maybe it's not that dramatic. 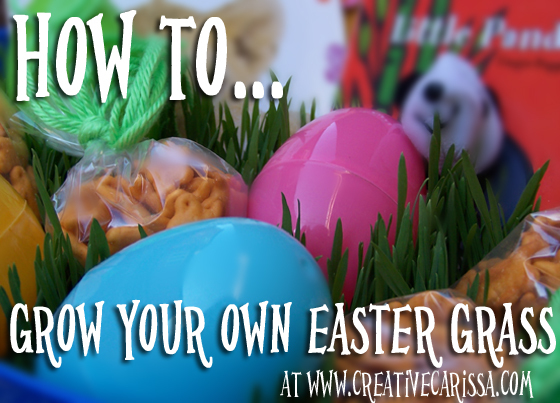 But I hate unnecessary plastic and I feel like Easter "grass" is the epitome of unnecessary plastic. It's not pretty, lacks any kind of real purpose, is not recyclable and it gets tracked all over your house before getting dumped in the trashcan. 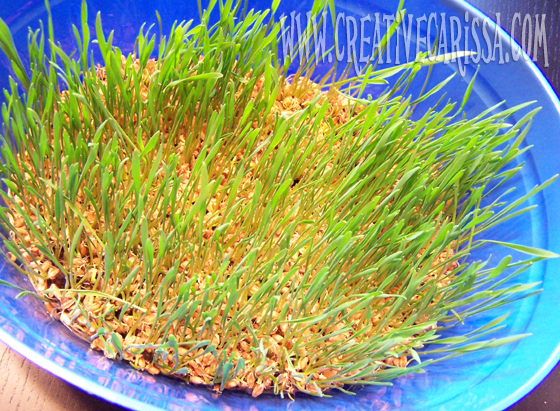 Last year, we started a tradition of growing our own Easter grass and I love it! It costs less. I paid $0.30 for enough wheat berries to grow 2-3 large baskets worth of grass. That's $0.15 per basket instead of $1 or more for each basket's worth of plastic shreds. That's an 85% savings! No waste. You can compost your leftovers. 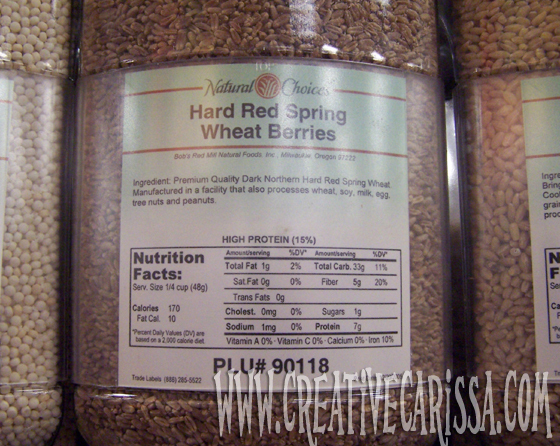 Look for wheat or rye berries in the bulk foods section of your local grocery or natural foods store. If you are using a woven basket, line the bottom with a piece of foil or plastic wrap to protect the basket from the dirt and water. Roll up the edges to create a lip to hold in any excess moisture. 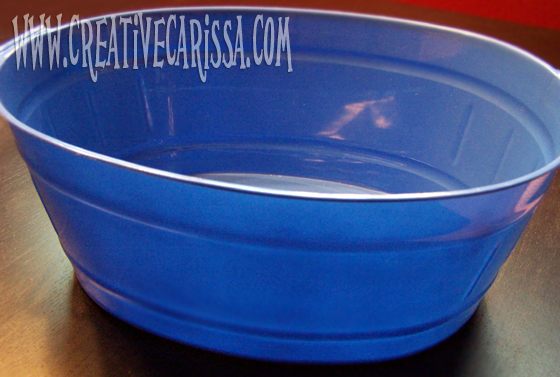 I'm re-using a small plastic storage tub so I didn't need to line mine. 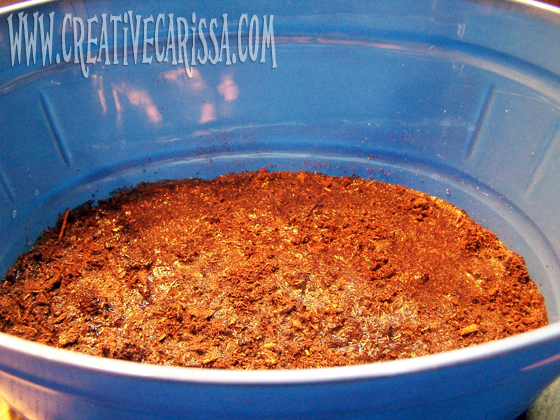 Spread out a thin layer of potting soil in the bottom of your container. Make sure that is is thoroughly damp. 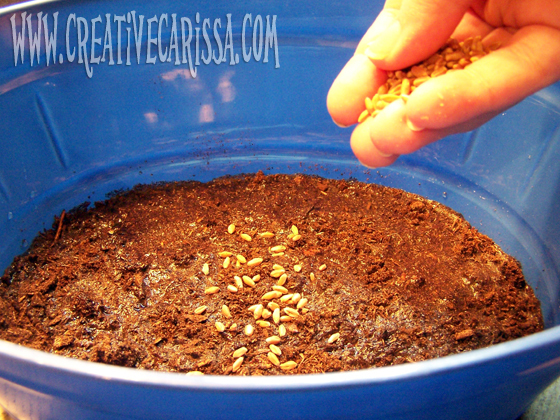 Generously sprinkle the rye or wheat berries across the top of the damp soil. Step 4: Sprinkle with water. Sprinkle the berries with water. I used a sippy cup which had the non-spill stopper removed. If you don't have a sippy cup, you can use a spray bottle or sprinkle the water with your hand. For first few days I kept my basket on top of my fridge where it was warm (the plants don't need sun until they start looking like plants). On day four I moved the basket to a sunny window during the day and kept it warm at night. 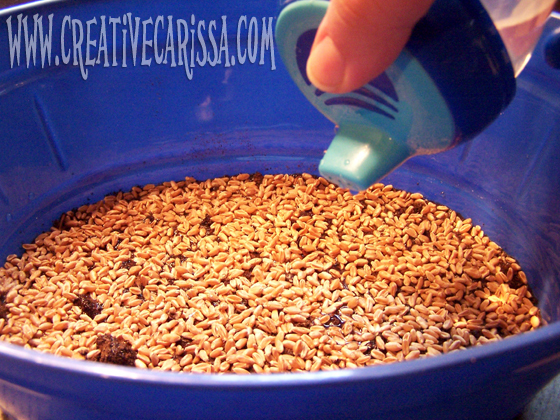 Make sure to keep sprinkling water on the seeds once or twice a day to keep the growing plants happy. 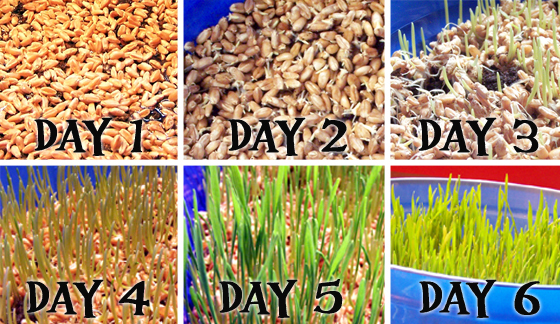 It's really quite amazing how quickly this stuff grows! 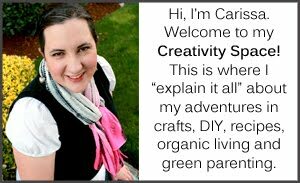 If you're homeschooling, you can use this as a fun way to incorporate science and math (measuring!) into your curriculum, too. This project is so easy and fun that I hope I've encouraged you to start your own Easter grass growing tradition, too! Your grass looks GREAT!! I just grew some too. I love this, especially since I still have time to give it a go! What a great idea! I was disappointed I hadn't seen it earlier until I read that it only takes 7 days so there's still time! Thanks for sharing! 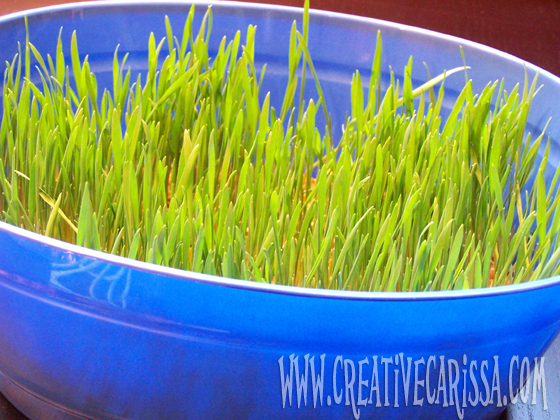 This is a great idea for growing grass for your indoor cats to eat and lots cheaper than the little pots of grass you see for cats at the pet stores! Thanks for the idea! Cute! 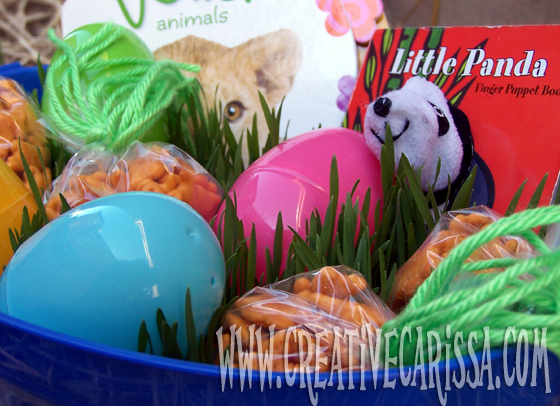 If you have kitties or chickens, they will enjoy the treat!